Clubhouse with changing rooms, bar, restaurant, lounges, leisure facilities, accommodation and pro shop. Golf facilities include practice areas and equipment hire. Opened in 2004 La Reserva already has maturity that exceeds expectations. The course is situated in two valleys, which join in the form of the letter "Y". The course itself is extremely impressive and has a quality that is difficult to match. The shaping and features are large but neatly fit in with the wonderful surroundings. 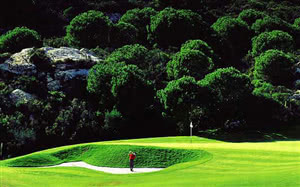 The course is relatively long and Sotogrande hope to host major international tournaments in the future. However, there are two forward men's and ladies tees that should enable all classes of golfers to enjoy their round. A unique and clever computerised irrigation system ensures the course is always presented in perfect condition. Indeed, the fairways are magnificent and amply wide. Water hazards are a feature of the course and are found on no less than six holes but only in one instance is there a frontal hazard. We would say that the greens are really the heart of the course as they are relatively large providing bigger targets for the average player. However, to be on the green in regulation is one thing but to be on the right part is another, don't be fooled into thinking you are home and dry until you have seen the pin!